Working in the data visualization field, I’m intrigued by different datasets and using graph visualization to explore, understand and interact with them. I came across this interesting New York taxi cab database and this study, and I was curious to see what I could uncover using KeyLines – the graph visualization toolkit. The data includes information on taxi trips taken in the city and the study found an increase in cab activity between the Federal Reserve Bank of New York and major Wall Street banks around the time of central bank policy meetings. In this blog, we’ll see how the graph visualization approach can be useful when working with large and complex datasets like this one. Let’s take a look! Looking at data as a table, like the one above, it’s difficult to gain any insight. KeyLines is a toolkit for building game-changing interactive visualizations that unlock insights in complex graph data. 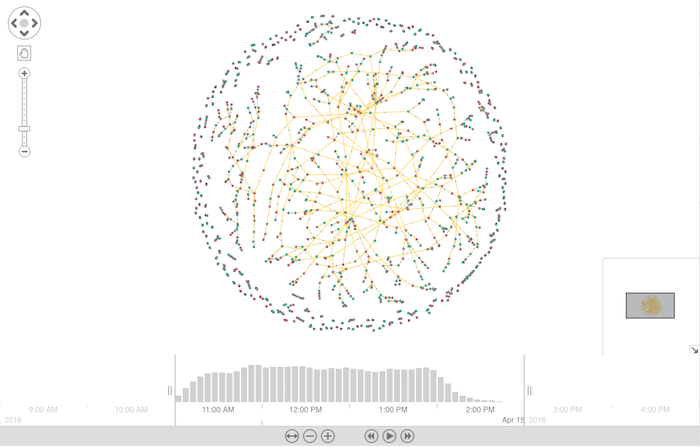 By visualizing connected data as a graph, you can quickly find and investigate anomalies in data. Before we start, we need to decide on our data and visual model. Green nodes to represent a pick-up location, with a value indicating the number of passengers. Red nodes to represent a drop-off location with values showing the total fare and any tips. Grey glyphs on the links to highlight the distance of the journey in miles. Using KeyLines geospatial – an integration for visualizing connected data on maps – I was able to visualize the data on a map. Depending on your needs or preference, KeyLines allows you to switch from a map view to a topographic view in one click. By visualizing the dataset, we can begin to spot patterns which may not have been as obvious in a textual format – providing users with the accurate, fast insight they need. Our chart is quite cluttered, let’s clear it up a bit. The above chart gives us a great overview but let’s zoom in to gain more insight. By selecting a glyph, the time bar reveals information relevant to the selected trip and shows it as a yellow trend line in the histogram. Let’s see how social network analysis (SNA) measures can help us understand this dataset better. Now, let’s focus our attention on combos, KeyLines’ exclusive node-grouping functionality. 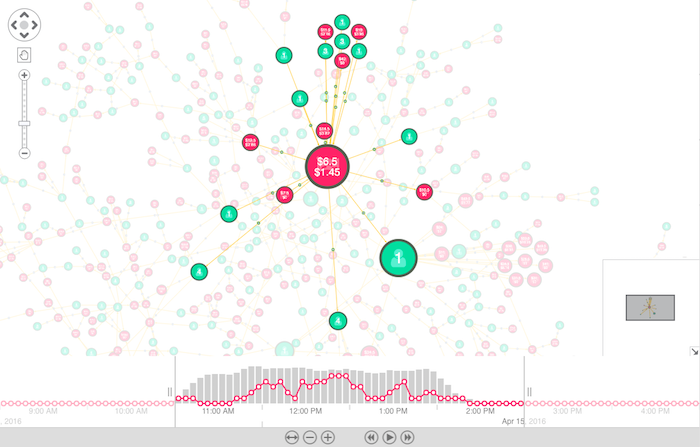 Combos are an intuitive and powerful way to explore your most complex networks. By combining nodes into groups we can clear up some of the clutter, and understand some of the macro-trends happening in out data. I used combos to combine the nodes into geographic zones, and added donuts to indicate the volume of pick-ups (green) and drop-offs (red). Charts with many nodes and connections are a challenge for any analyst to deal with. Using these simple techniques, we can simplify a complex scenario into a single visualization that can be understood at a glance – a great starting point for any data investigation. 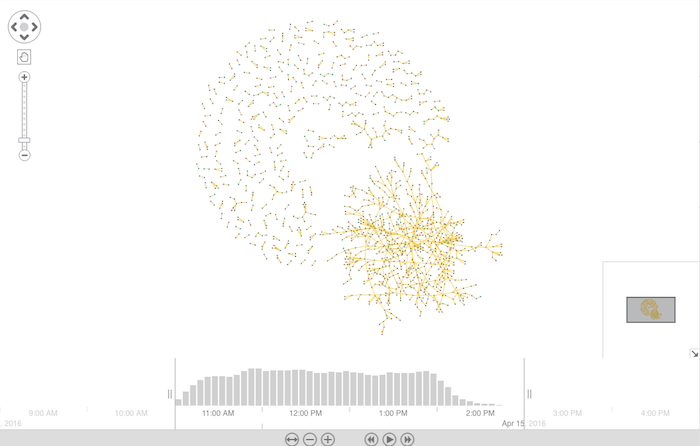 Visualizing data in an interactive and dynamic way can help you uncover patterns and recognize connections you may not have been able to with alternative methods of analysis. Discover the true power of graph visualization by trying out KeyLines yourself. Request a free trial here.